At 7:30 am I stand waiting for my van to Antigua, Guatemala. About ten to 8, my driver gives a honk and I scurry over to the van. He is a jovial man with a big belly tucked in with a bright red shirt. You always want your driver to have a cheerful disposition. He has your safety in his hands. We lumber around San Cristobal’s small colonial streets for about an hour to pick up all of our passengers. We leave city limits around 8:30. The gesture of being picked up at one’s accommodations is convenient, luxurious even, but horribly inefficient. Our driver asks each person as they board if they have their passport on them. Confused white faces timidly nod. Outside of San Cris we traverse the beautiful mountainsides. We all lull into a daze except for the two women in the middle talking about positive energy. At the border, our drivers gives us a proposition. We can give him all our passports and 300 pesos, and he will take them to his ‘friend’ in the bank and we’ll expedite the process of leaving Mexico. Except for the few that go it alone because this ‘exit tax’ doesn’t apply to them (having been in the country less than 7 days), we all agree. We hand over our passports and 300 pesos. Our portly, high-spirited driver is true to his word, and within ten minutes he is back with our passports. The process could take an hour, or more, without such, err, official uhh arrangements. Near the Guatemalan Border crossing, our driver parks on a side street and tells us to walk across the border, because he can’t take his van across. He will meet us on the other side. Our passports are processed without incident. There, we wait for our next vehicle, our cheery driver assuring us that it is on its way. Within the half hour, we are loaded up on a slightly larger bus. We open the windows and let the air brush past us as we enter the Guatemalan countryside. 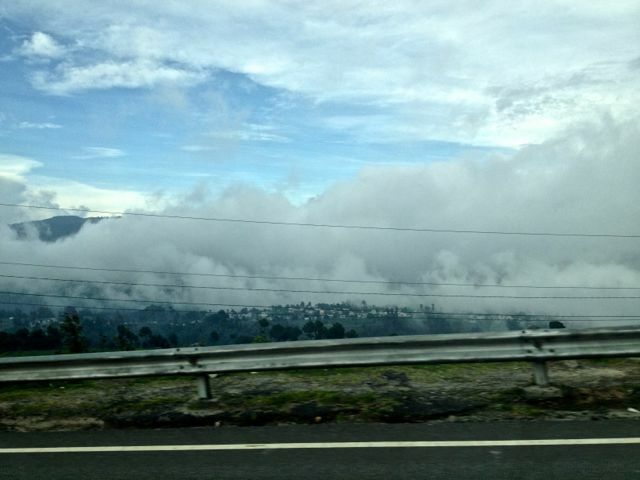 Much like Chiapas, verdure and thick clouds cover rolling hills and mountains. Volcano peaks loom over valleys. Entire Villages seem to be enveloped by creamy clouds. At our second stop, passengers split based on their destination. I hop on a small passenger van headed for Antigua with three others as it grows dark. We turn through endless curves, something that my stomach is starting to get used to. Around 8pm we arrive in Antigua. The total trip takes 12 hours, including the help of our ‘friend’ at the Mexican border crossing. And our lost 300 pesos. This entry was posted on June 12, 2013 by alexjparton. It was filed under Americas, Guatemala, Mexico, Travel and was tagged with Antigua, Guatemala, Mexican Border.